Compressed gases are used in many different industries for a variety of different applications; including research laboratories, medical laboratories, health sciences, fine arts, construction, and oil and lubricant manufacturing. Hazards associated with improper compressed gas storage can be fatal, therefore gas cylinder storage safety must be properly addressed to maintain a safe workplace. Gas cylinder storage safety – Safe gas cylinder storage buildings by US Chemical Storage. According to the Occupational Safety and Health Administration, “Hazards associated with compressed gases include oxygen displacement, fires, explosions and toxic gas exposures, as well as the physical hazards associated with high pressure systems. Special storage, use, and handling precautions are necessary in order to control these hazards”. Compressed gas cylinders can cause dangerous work environments if inventory is not properly stored and maintained. Follow the guidelines outlined below to keep your workplace safe. Contact your compliance manager to learn more about safe chemical storage in your state. Store gas cylinders in an upright position using gas cylinder storage racks. Keep compressed cylinders storage away from flammable and corrosive materials. Organize gas cylinder storage separate from oxidizing gases (store acetylene and propane cylinders away from oxygen cylinders). Keep compressed cylinders away from electrical connections and other sources of ignition. Segregate oxygen and fuel gas cylinders using solid, fire-rated partition walls. Store compressed cylinders at temperatures below 125°F; according to OSHA under the General Industry standard 29 CFR 1910.101. Store corrosive materials in a separate storage area. Rusting can damage gas cylinders, potentially creating a hazardous environment. Cylinders, full or empty, must comply with DOT and NFPA labeling requirements and OSHA hazard communication regulations. Keep Material Safety Data Sheets (MSDS) on hand for each type of chemical being stored. Ensure proper ventilation when storing toxic chemicals. Take inventory of gas cylinder storage. Organize gas cylinders into groups: “FULL” or “EMPTY”. Gas pressure regulators should be inspected every 5 years. Allow space for personnel or carts to be used for transporting gas cylinders in and out of your gas cylinder locker. Keep cylinders away from exit or entry doors. Caps must be on when not in use. Utilize gas detector alarms for maximum safety. 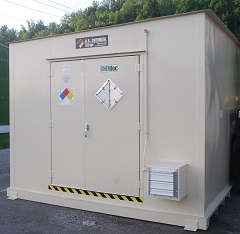 To learn more about gas cylinder storage building by US Chemical Storage visit us online or call 1-888-294-2729 for a free chemical storage consultation.